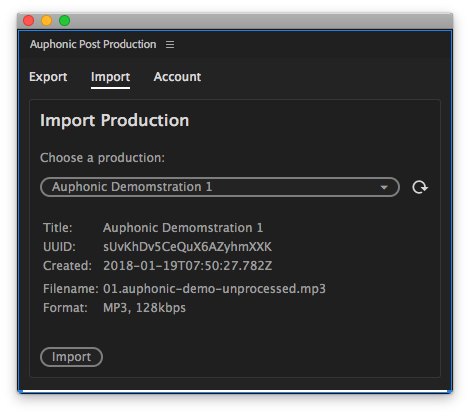 It is possible to export tracks/projects from Audition/Premiere and process them with the Auphonic audio post production algorithms (loudness, leveling, noise reduction - see Audio Examples), use our Encoding/Tagging, Chapter Marks, Speech Recognition and trigger Publishing with one click. 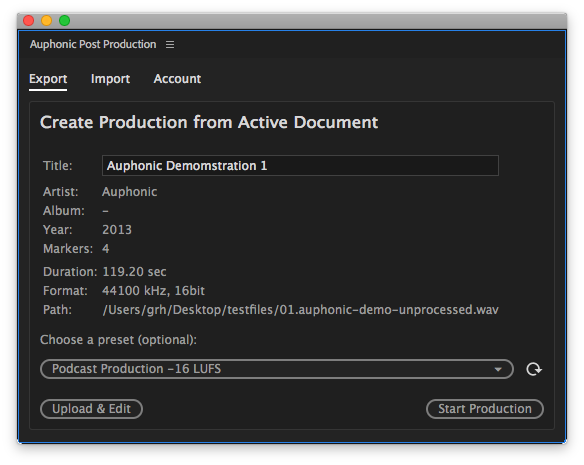 Furthermore, you can import the result file of an Auphonic Production into Audition/Premiere. 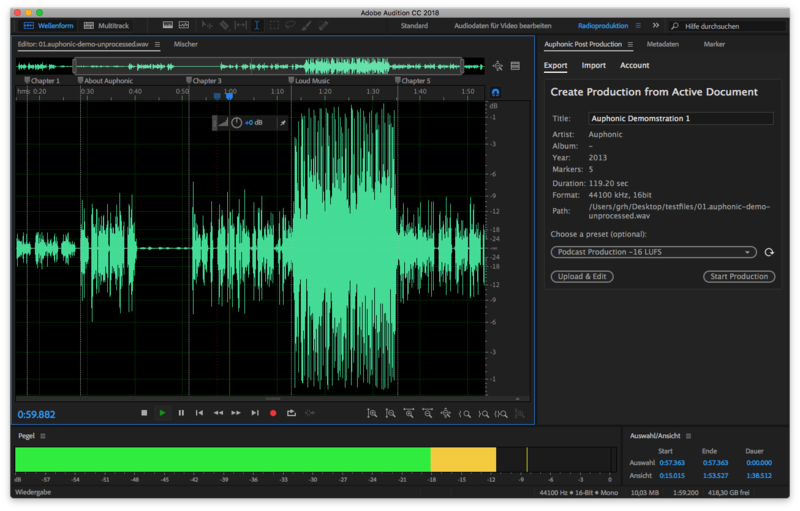 Audition Waveform Editor with the Auphonic Audio Post Production Add-on. Metadata, Marker times and titles will be exported to Auphonic as well. You can upload the audio of your current active document (a Multitrack Session or a Single Audio File) to our Web Service. In case of a Multitrack Session, a mixdown will be computed automatically to create a Singletrack Production in our Web Service. Unfortunately, it is not possible to export the individual tracks in Audition, which could be used to create Multitrack Productions. 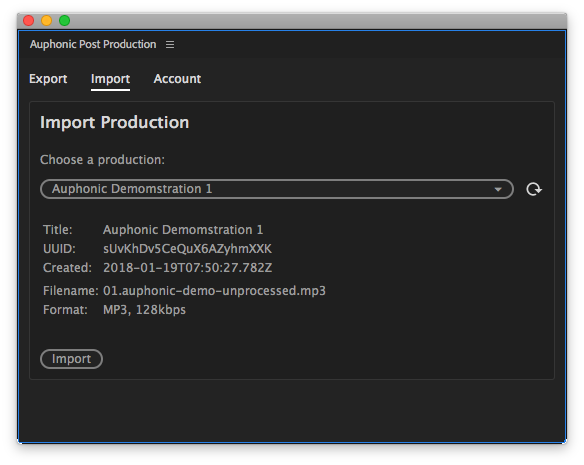 All metadata (see tab Metadata in Audition) and markers (see tab Marker in Audition and the Waveform Editor Screenshot) will be exported to Auphonic as well. Marker times and titles are used to create Chapter Marks (Enhanced Podcasts) in your Auphonic output files. You can optionally choose an Auphonic Preset to use previously stored settings for your production. Click Upload & Edit to upload your audio and create a new Production for further editing. After the upload, a web browser will be started to edit/adjust the production and start it manually. Click Start Production to upload your audio, create a new Production and start it directly without further editing. A web browser will be started to see the results of your production. Uncompressed Multitrack Sessions or audio files in Audition (WAV, AIFF, RAW, etc.) will be compressed automatically with lossless codecs to speed up the upload time without a loss in audio quality. FLAC is used as lossless codec on Windows and Mac OS (>= 10.13), older Mac OS systems (< 10.13) do not support FLAC and use ALAC instead. To import the result of an Auphonic Production into Audition, choose the corresponding production and click Import. The result file will be downloaded from the Auphonic servers and can be used within Audition. If the production contains multiple Output File Formats, the output file with the highest bitrate (or uncompressed/lossless if available) will be chosen. 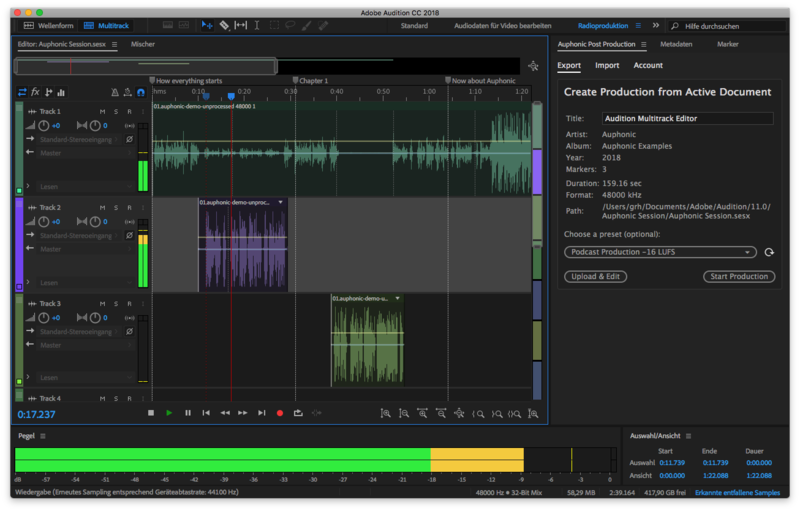 Premiere Video Editor with the Auphonic Audio Post Production Add-on. 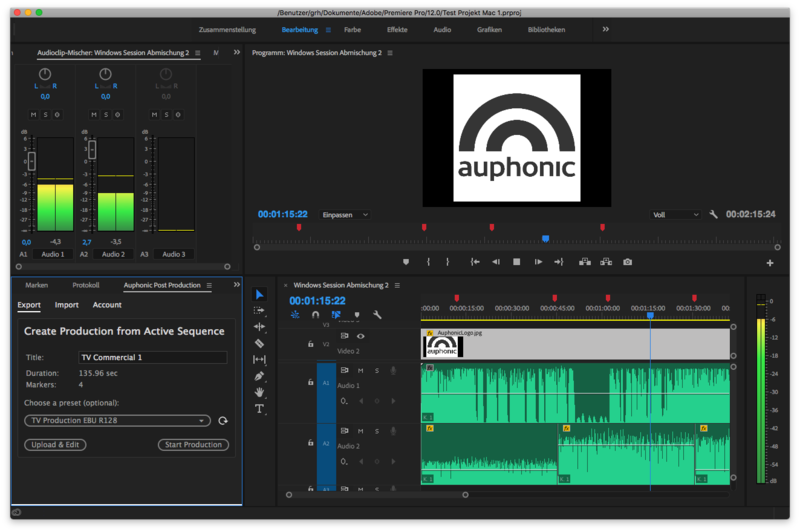 The Auphonic Add-on can be embedded directly inside the Adobe Premiere user interface. You can upload the audio of your current Active Sequence in Premiere to our Web Service. We will automatically create an audio-only mixdown of all enabled audio tracks in your current Active Sequence. Video/Image tracks are ignored: no video will be rendered or uploaded to Auphonic! If you want to export a specific audio track, please just mute the other tracks. Chapter Markers in Premiere (not all the other marker types!) will be exported to Auphonic as well and are used to create Chapter Marks (Enhanced Podcasts) in your Auphonic output files. The mixdown of your Active Sequence in Premiere will be compressed automatically with lossless codecs to speed up the upload time without a loss in audio quality. 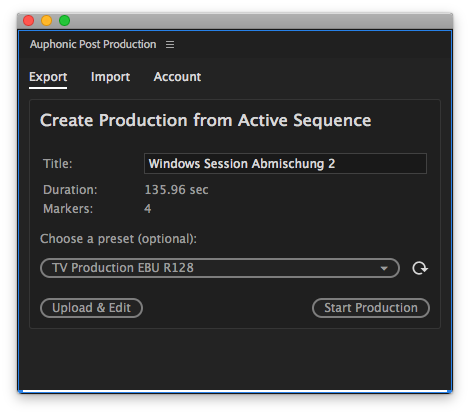 To import the result of an Auphonic Production into Premiere, choose the corresponding production and click Import. The result file will be downloaded from the Auphonic servers and can be used within Premiere. If the production contains multiple Output File Formats, the output file with the highest bitrate (or uncompressed/lossless if available) will be chosen. The installation requires the Adobe Creative Cloud desktop application and might take a few minutes. Please also also try to restart Audition/Premiere if the installation does not work (on Windows it was once even necessary to restart the computer to trigger the installation). navigate to Window -> Extensions and click Auphonic Post Production. Thanks a lot to Durin Gleaves and Charles Van Winkle from Adobe for their great support!